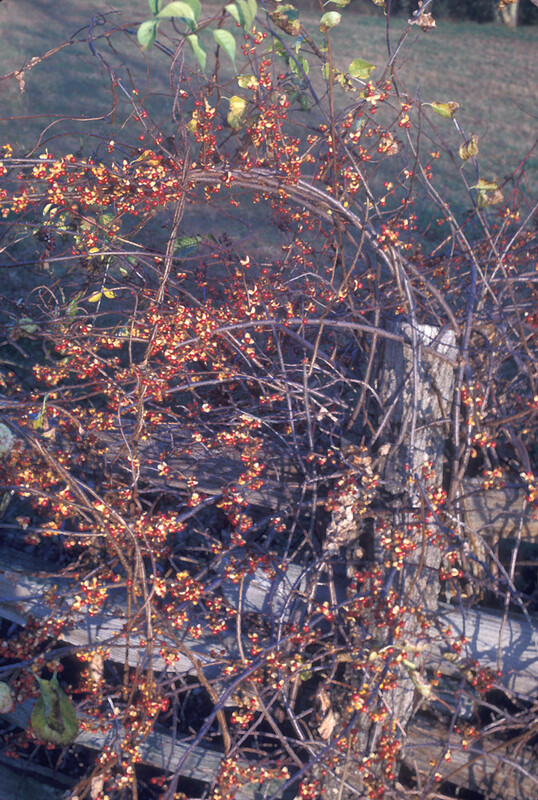 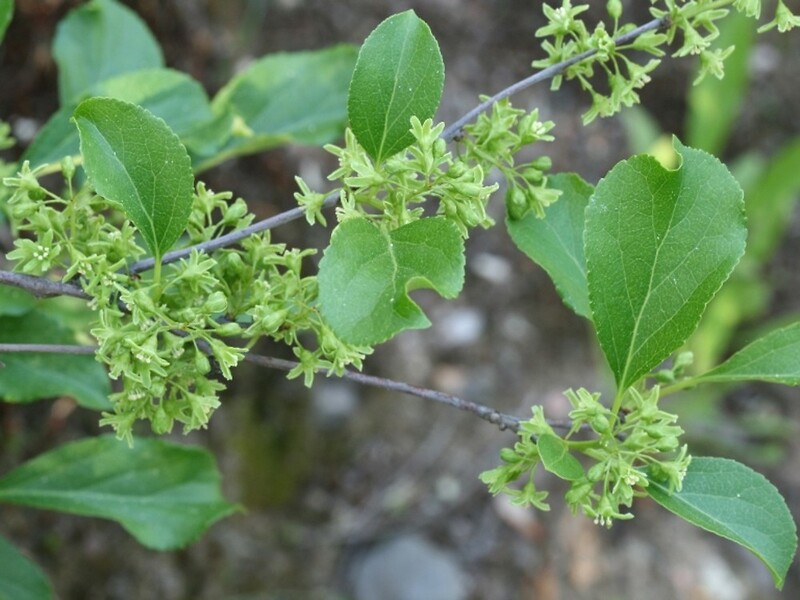 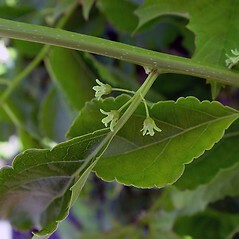 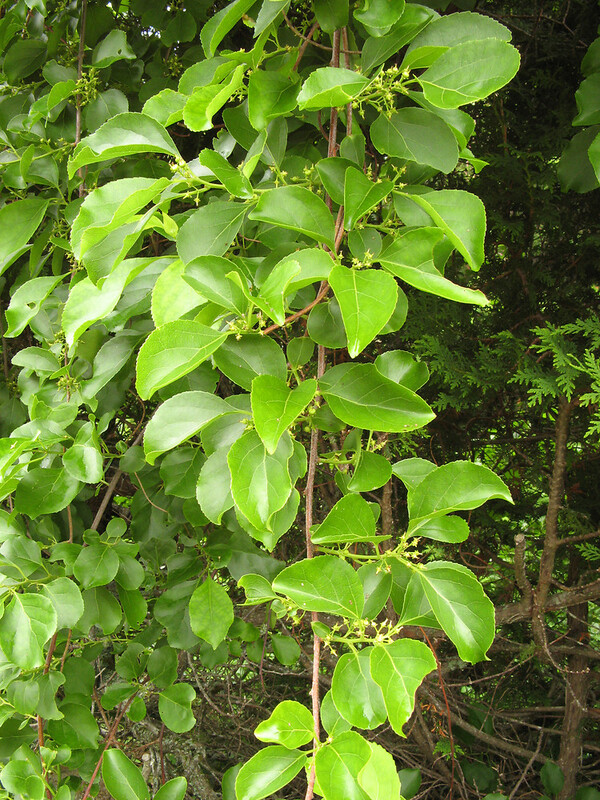 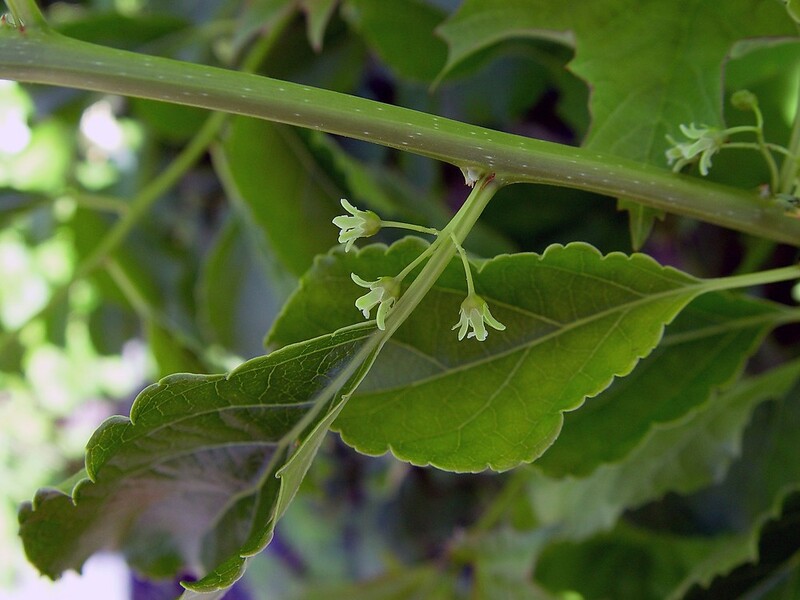 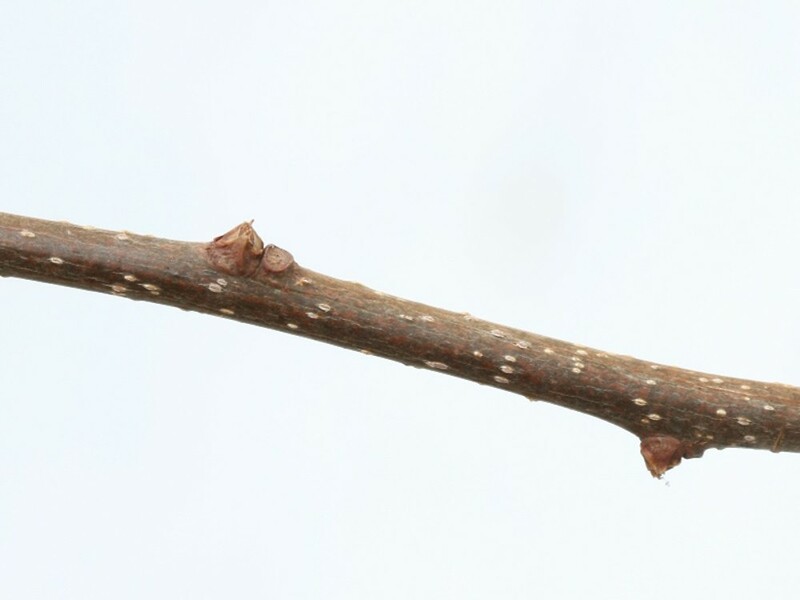 Asian bittersweet was introduced from its native East Asia in 1860 and now grows in much of the eastern United States. 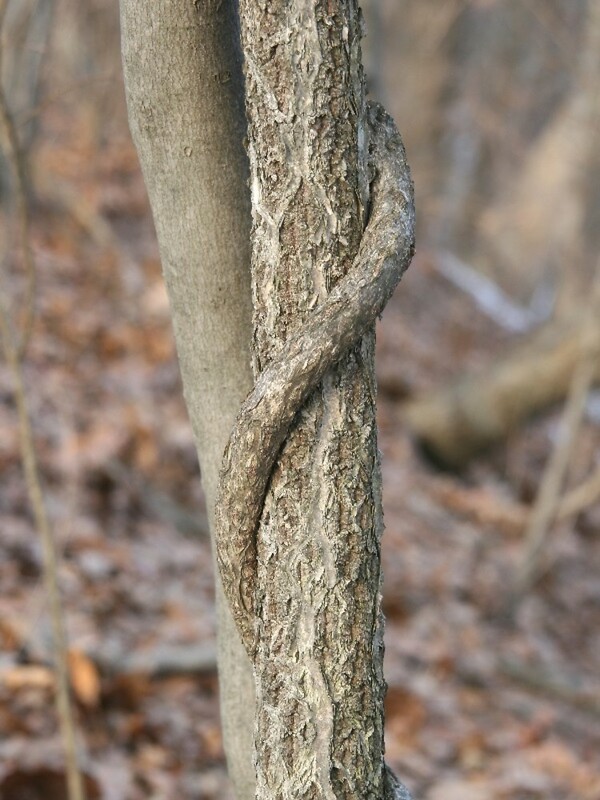 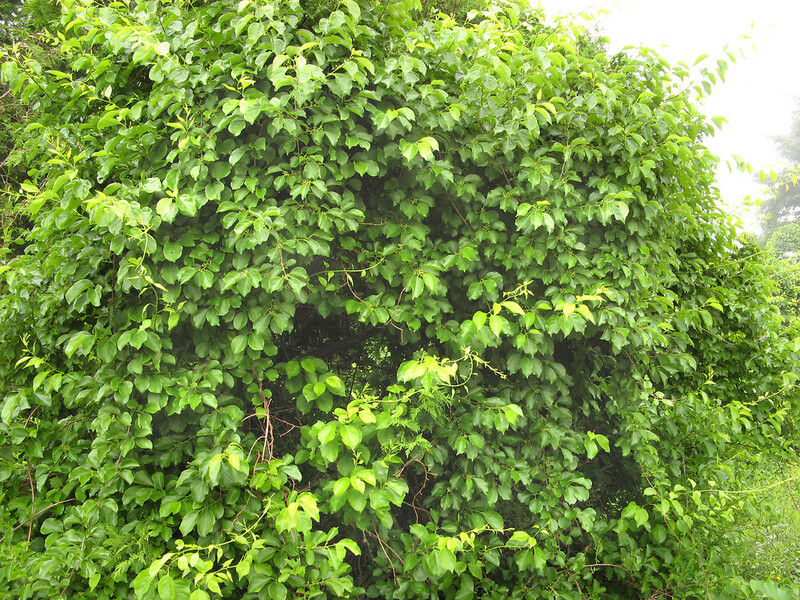 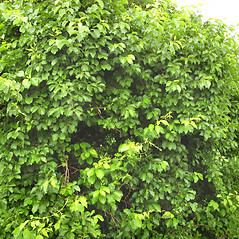 This aggressive vine tolerates both high sun and deep shade, and can quickly overtop and girdle trees. 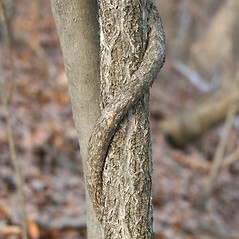 This species has long been regarded as an attractive ornamental. 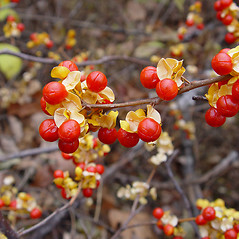 Its abundant clusters of yellow seeds surrounded by a fleshy red aril are often used to make festive wreaths and flower arrangements. 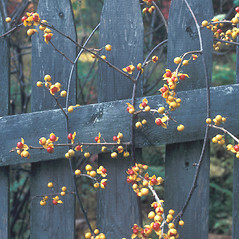 Seeds are spread when the plants are later thrown away. 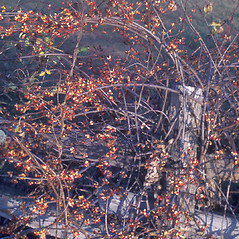 Birds also relish the fruits and disperse the seeds far and wide. 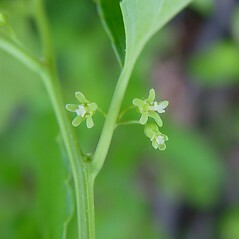 flowers in a terminal array of 6 or more flowers, leaf blades usually more than 2 times as long as wide, and capsules usually with 0 or 1 seeds (vs. C. orbiculatus, with flowers in axillary arrays with 2 or 3 flowers, leaf blades usually less than 2 times as long as wide, and capsules usually with 5 or more seeds). 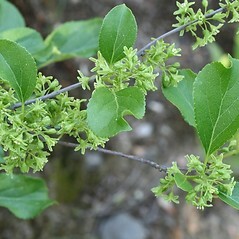 Asian bittersweet. 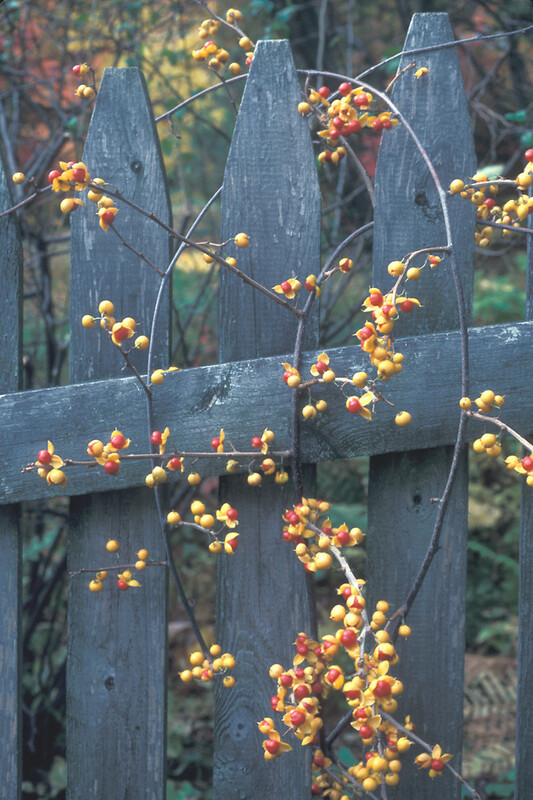 CT, MA, ME, NH, RI, VT. Forests and forest edges, roadsides, clearings, open rights-of-way. 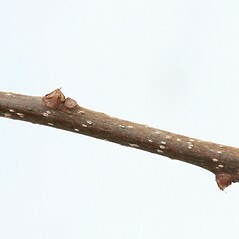 1×2. 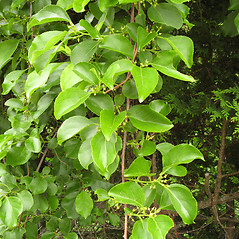 Celastrus orbiculatus × Celastrus scandens → This rare bittersweet hybrid is known from MA. 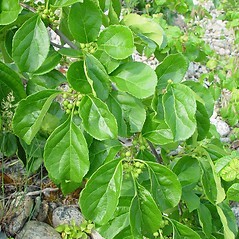 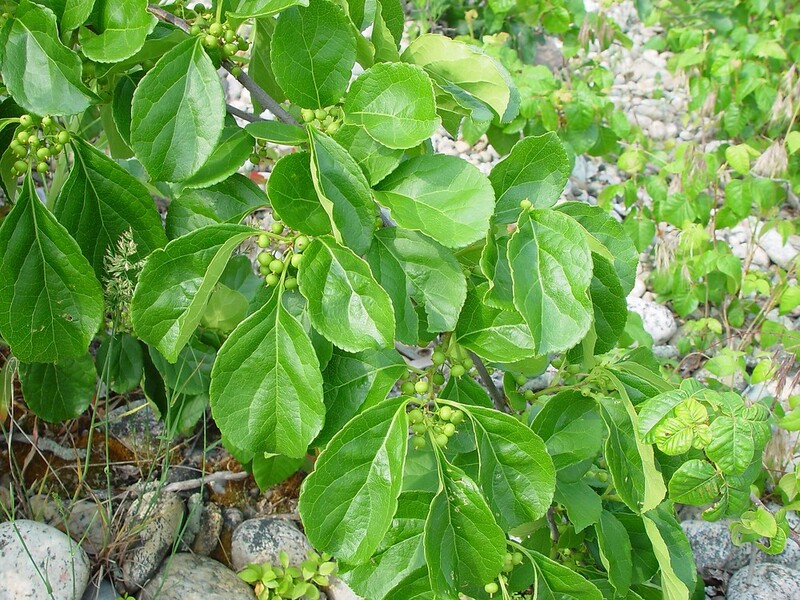 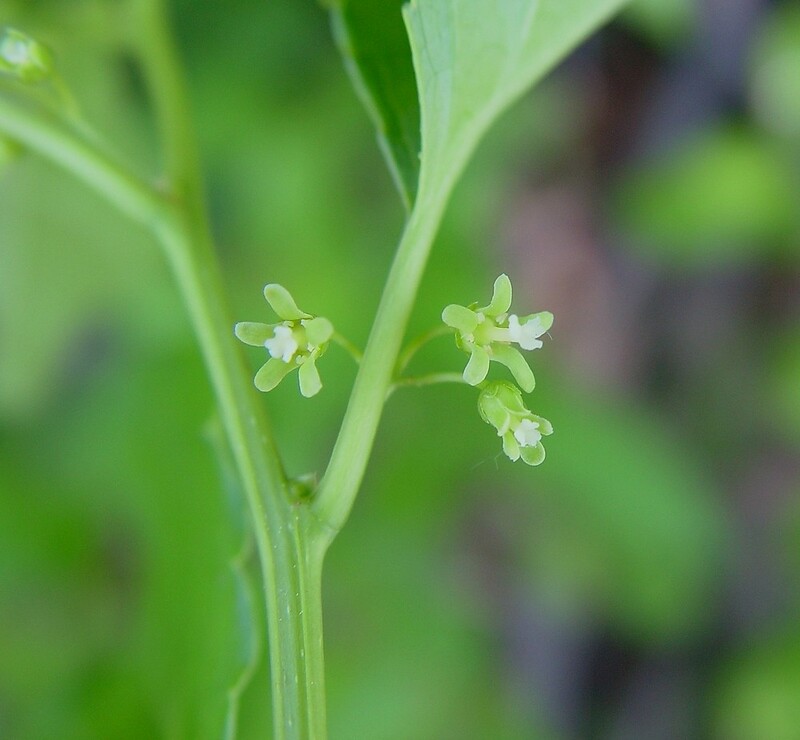 It is best identified by its blending of characters (e.g., intermediate capsule and/or anther color) or by its combination of characters (e.g., leaf blades of one species and inflorescences of the other species). 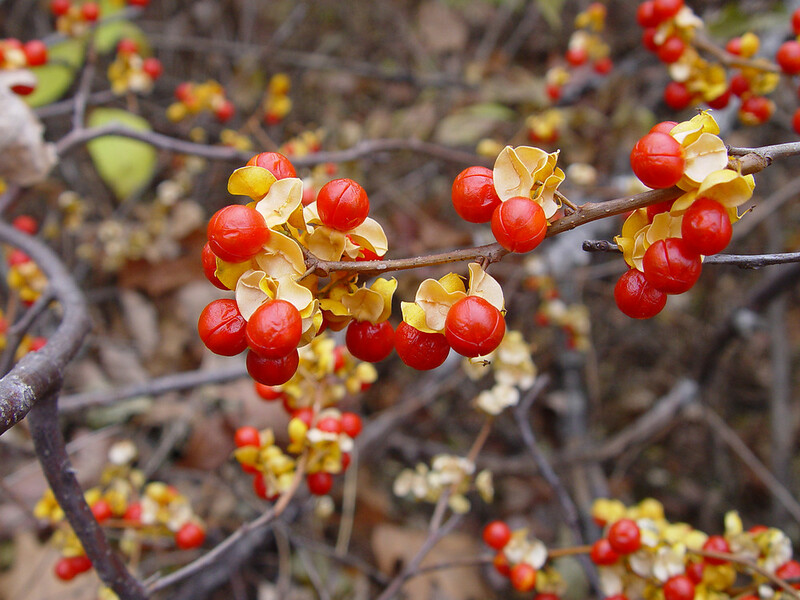 The outer and inner valves of the capsule often display an intermediate color between the parental species—yellow to orange-yellow in Celastrus orbiculatus, deep orange in C. scandens, and bright orange in the hybrid.